Ways to Give | Command and General Staff College Foundation, Inc. While appropriated federal funding is adequate for the infrastructure and operating costs needed to maintain the educational baseline, funds that support and expand the Margin of Excellence in CGSC must come from private resources. Philanthropy, the means of obtaining these private resources, is an essential role for the CGSC Foundation. 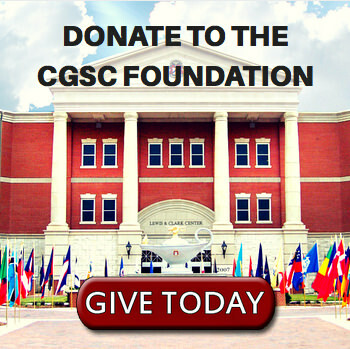 Through its philanthropic efforts the CGSC Foundation helps CGSC produce exceptional leaders capable of dealing with the new environmental and operational challenges of a post-9/11 world. 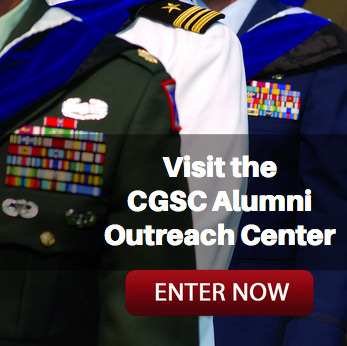 The CGSC Foundation is funded through private donations and its board of trustees is staffed with distinguished retired military leaders, business executives, community leaders and others who are focused on providing the Margin of Excellence to the educational programs of the U.S. Army Command and General Staff College. As you consider your year-end tax planning or overall estate planning, we hope you will consider making good use of the income tax charitable deduction. Your charitable gifts can significantly reduce your income taxes, while providing meaningful support to the CGSC Foundation and other non-profit organizations. Gifts of Cash – Gifts of cash are fully deductible, up to a maximum of 50% of your adjusted gross income. Any excess can generally be carried forward and deducted over as many as five subsequent years. Life Insurance – Contributing the proceeds of your life insurance policy is a rewarding way to make a significant gift with a great deal of convenience and little expenditure. Bequest in Will – When a loved one passes away the federal estate taxes can be as high as 40 to 50% of the estate’s value. It definitely pays to do some advance planning with your attorney and financial advisors. One of the options to consider in your estate planning is a charitable bequest. You can help the foundation while reducing estate tax dollars. Charitable Remainder Trust – As its name implies, the intention of creating a charitable remainder trust is to provide a benefit to a charity. In addition to the satisfaction of leaving a gift today that will secure a benefit to the CGSC Foundation in the future, it provides many other economic benefits for you and your family to enjoy during your lifetimes as well, making it a key component of your estate plan. Charitable Lead Trust – A charitable lead trust works similar to a charitable remainder trust, except that now the CGSC Foundation receives the set amount of fixed income for a period of years, and then you or your family receives the remainder when the trust ends. Charitable Gift Annuity – A charitable gift annuity is a way for you to make a gift to the CGSC Foundation and still secure a steady stream of partially tax-free income for yourself, your spouse, your children, or other beneficiaries you may choose. It combines both charitable giving an d financial investing. Personal Property – Gifting your personal property, such as antiques, artwork, collectibles, and rare books, may entitle you to a charitable deduction based on the gift’s full fair market value. While gifts of tangible personal property are handled on a case-by-case basis, it is the policy of the Foundation to sell gifts of personal property. We will make sure the proceeds from the sale of your gift further the mission of the Foundation and that others learn and benefit from your treasures for years to come. Real Estate – A residence, vacation home, farm or vacant lot may have so appreciated in value through the years that its sale would mean a sizeable capital gains tax. By making a year-end gift of this property instead, you would avoid the capital gains tax and at the same time, receive a charitable deduction for its full market value at the time of the gift. It is also possible to gift your real estate so that you can continue to use it during your lifetime while receiving the deduction in the year you gifted the property. Securities – Gifting appreciated securities is one of the most popular ways of giving because they offer an easy and tax-efficient way of making a lasting contribution to the CGSC Foundation. You will receive a triple tax benefit when you gift long-term appreciated securities to us. You receive an immediate charitable income tax deduction, you avoid capital gains tax, and a reduction in potential estate taxes. Retirement Plan Assets – You may have accumulated significant savings in one or more tax-deferred retirement accounts, such as 401(k) and 403(b) plans, Keogh plans, IRAs, tax-sheltered annuities, or other employee retirement plans. If you wish to reduce income and estate taxes and are considering leaving a gift to the CGSC Foundation, we would like you to know that gifting all or a portion of your retirement accounts to us can make good estate planning sense. The information provided here is necessarily general in nature, but we would be glad to work with you to provide more information. The best advise for anyone considering charitable gifts is to consult your tax and financial advisors and your estate planning attorney. If you are a member of the United Way Tocqueville Society you can designate your United Way giving to the Command and General Staff College Foundation. When you fill out your Tocqueville pledge form simply write in “CGSC Foundation.” Also, include the address: 100 Stimson Avenue, Suite 1149, Fort Leavenworth, KS 66027 and Attn. Ann Soby.